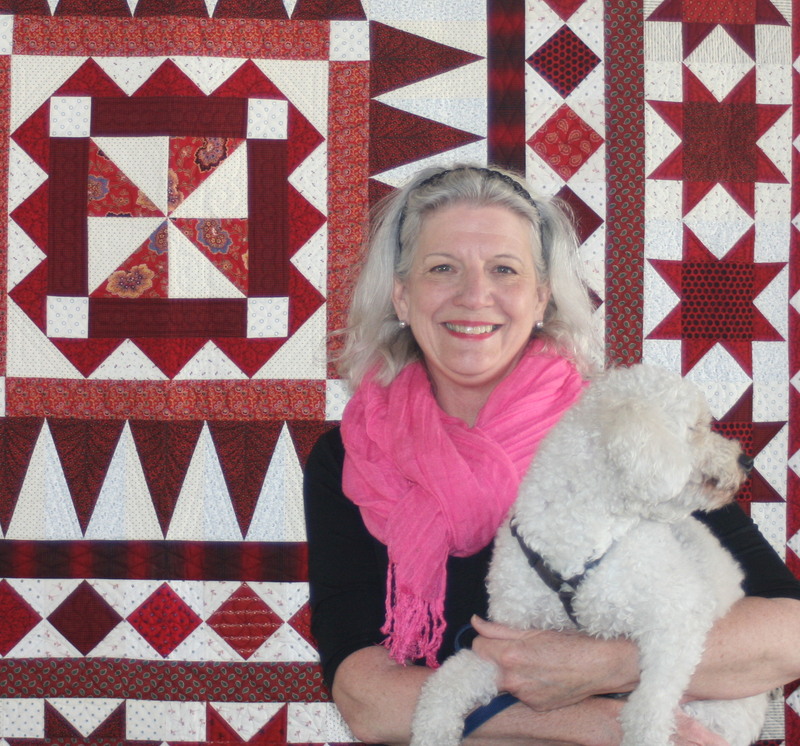 Whether you’re a quilter, a quilt lover, or someone who simply loves a road trip on a beautiful spring day, head for Winterset, Iowa, Saturday, April 27, for the second-ever Airing of the Quilts, a fabulous, one-day production of the Iowa Quilt Museum. From 10 am to 4 pm, our small town (pop. 5276) will be (ahem) blanketed in quilts as we host over fifteen unique displays—including (for the second time in history) hanging within three of our famous covered bridges. Quilts will be aired in churches, at the public library, in historic homes, at Piece Works quilt shop, on the porticoes of our native limestone courthouse—smack dab in the center of the town square—and of course inside the museum itself, among other locations. Have a finished top you’ve never managed to get quilted? You can bid on longarming by my personal machine quilter, with binding by . . . me! Need a T-shirt quilt for someone you love? An outstanding Winterset quiltmaker will work with the winning bidder to custom-make, machine quilt, and bind it, so you can give it to that special person now, instead of fifteen years from now! Been longing for a barn quilt block for the side of your home, shed, or garage? Come and bid on one. Want to solidify plans THIS YEAR to come back next year? Bid on Friday night lodging at the beautiful Judge Lewis Bed & Breakfast for The Airing 2020! On April 27, I’m not sure where I’ll be—everywhere, I’m guessing. Find me, and I’ll give you a hug! For sure, I’ll be awarding a Quilt of Valor at Monumental Park (just a block off the square) at 2 pm, so come join other onlookers as we thank a Vietnam War veteran for his service. Before and after, I’ll be at the the museum and around the square, and at the dinner, trunk show, and auction, and would simply love to greet you! Scroll down at this link to the red rectangular tabs to purchase advance tickets to The Airing of the Quilts displays (just $20) and the early evening event (just $40 for drinks, dinner, and a fun social time)—all in support of the beautiful Iowa Quilt Museum in historic Winterset! *There’s also a Silent Auction of about a dozen items including your scissors sharpened and your sewing machine serviced by Joyce Franklin at Piece Works. During my 20+ years on public television I’ve spent plenty of time in front of a camera, usually four big ones, on the set of “Love of Quilting.” Delivering the goods in my home was a different, but great, experience. I greeted Alex and Ricky at the front door (holding my dog Scrabble) and showed them into the living room. I toured them through the house and into my bedroom, where we had stacked some favorite quilts on the bed. The camera operator, in order to properly frame the shot, opened my closet door and backed in, carefully avoiding my shoes. 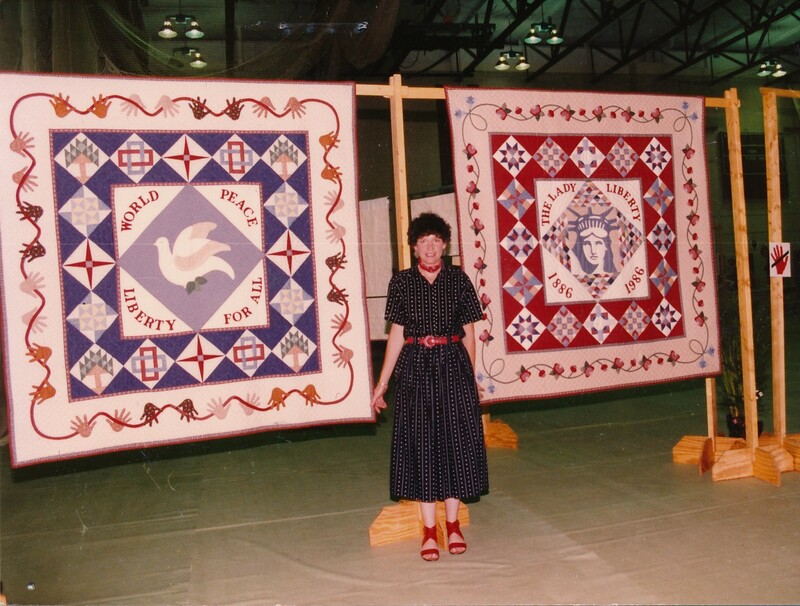 As we turned the quilts, I explained what inspired each—including “Unrattled Mom,” the one I made in 1987 after I shot a 42-inch rattlesnake with a .22 rifle out in Lincoln Township and made the front page of the Des Moines Register. In my sewing room, Alex and I chatted about my history with Quilts of Valor Foundation, which was meaningful, since Alex’s participation in two Iowa Public Television Quilts of Valor specials is what turned our relationship into a friendship. After lunch, the producer sat me down opposite her, both of us in identical dining room chairs so we’d be at exact eye level. Shelly had already talked with me at length on the phone, honing her many questions for the on-camera deep dive into my life. Like famous interviewer Barbara Walters, Shelly is a masterful prober. Over what seemed like hours, with the full crew silently watching, Shelly took me back in time. I described my childhood, my youthful dreams, my introduction to quilting in my 20s, my business partnership with Liz Porter, and my quilting career. I spoke of my children and my pride in each, of how I met Mark through his mother Vonda (a quilter) and married him. I explained my newfound love for my home town of Winterset, and my encore career as a novelist. Where I got choked up was in the segment on my family background, when asked for the secret of my success. I related an anecdote about my mother Dorothy Graham. Years ago, someone commenting to her on my accomplishments, said, “You must be so proud of Marianne.” My mother responded, “I’ve been proud of Marianne from the moment she was born.” I didn’t feel the emotion coming, but when I described my mother’s unconditional love, there it was. How fitting it feels—now that I’ve retired from TV to devote my time to Winterset and writing—to have the opportunity to look back on my life, to summarize my pursuits, to sift through old photos to find the perfect still shots for the beautiful video The Quilt Show created. From now through January 13, you can watch this 45-minute episode FREE, without subscribing to The Quilt Show. Click here and go back in time with me. Thank you, Alex, Ricky, and all the Quilt Show team! At age twenty-five, holding my newborn infant in my arms, I discovered a remarkable truth, almost as if Hannah were speaking to me. I had given myself in marriage and in childbirth, but oh, what I had received in return—a precious child! In those days, all I had to give were friendship, energy, time, and love, but the truth of Hannah’s lesson was continuously confirmed. For example, if I had two friends I liked a lot, I found a way to connect them. The result was more friendship rather than less friendship. Connecting friends in the quilting industry was one of my greatest joys. In terms of energy, especially in my 40s and 50s, it seemed the more I expended on my various projects, the more I had at my disposal. This paid off tremendously in my career. 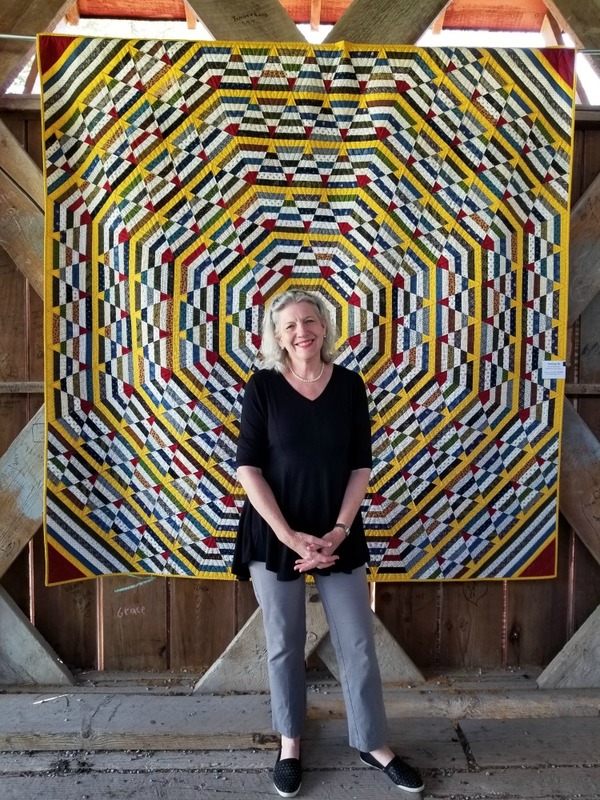 More recently, when I was asked to explore the possibility of a quilt museum in Winterset, I resisted at first, then poured myself into it. That undertaking reenergized me in ways more satisfying than I could ever have imagined. 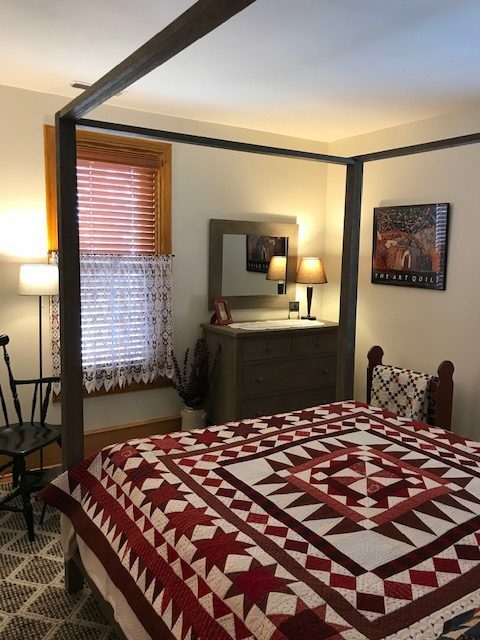 The Iowa Quilt Museum project reconnected me to my own home town and the people in it, huge gifts. Financially, I didn’t have much to give until after my children were educated and my business succeeded, but I have found Hannah’s truth applies in this area as well. Generosity enriches you, manyfold. 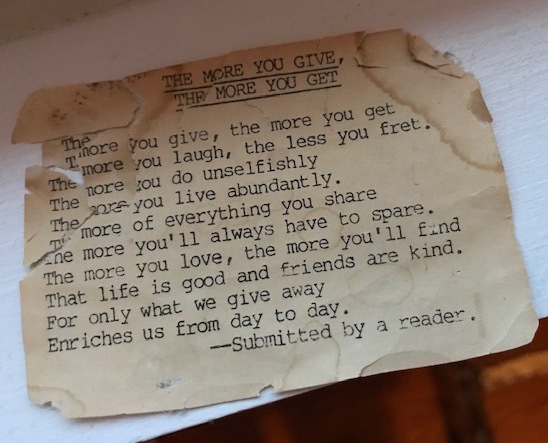 A sentimental but beautiful poem my mother Dorothy Graham published in the newspaper she owned and operated in Norwalk, Iowa, for more than twenty years perfectly expresses how giving works. I’ve kept it posted on various refrigerator fronts and bulletin boards over the years. “The More You Give, The More You Get” may be tattered, but its message is solid gold. 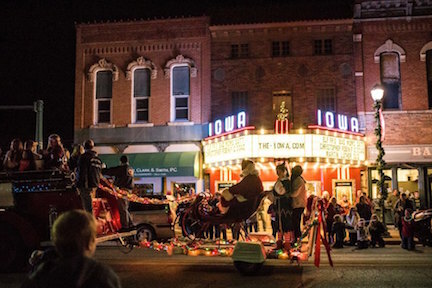 The Friday evening after Thanksgiving, families who’ve been working on leftover turkey and pie all day gather downtown for Winterset’s Festival of Lights. They drink hot cocoa, warm their hands at sidewalk burn barrels, and stroll around the square admiring lighted store windows, buying their first Christmas gifts, and greeting friends and neighbors. Here, children make their wishes known to Santa not at a shopping mall, but inside our native limestone courthouse. Meanwhile, decorated floats queue up at the old high school to be judged for prizes before the parade begins. At 7:15 Santa comes out and down the sidewalk to his sleigh (secured to a wagon pulled by a firetruck), and the long strings of lights that reach all the way from the corners of the square to the courthouse dome are magically lit. As the procession goes around the downtown block (twice), young adults visiting from the far off cities where they now live experience nostalgia for the past. Kids gather memories for nostalgia of the future. “Elf” (free with donations of food items for a local pantry) begins at the Iowa Theater at 8:00. We print the 150 tickets in advance and hand them out until they’re gone. Last year, down to just one ticket, two junior high age girls, obviously best friends, appeared at the door, horrified as they grasped the one-seat-left situation. “Oh please, please, please, can’t she just sit on my lap?” one asked. They scooted in as we taped the “Sold Out” sign to the door. Independent filmmaker Jack C. Newell* (who happens to be my son-in-law) rolled into town late Monday night, en route Chicago from Boulder, CO, where he recently wrapped filming on his latest project, a dark romantic comedy titled “Monuments.” The story involves a road trip-heist-chase, so he and two crew members were capturing scenes along the way, getting “journey footage” on their way home. They were driving two vehicles—a car, and the beat up old pickup featured in the movie. Earlier on Monday, a text from Jack asked if I might be able to organize some cows in a field along a highway close to town. They wanted a shot of the pickup truck barreling down the road . . . from the point-of-view of the cows. I called Peggy Casper. Jack and crew also requested a marquee-change at the Iowa Theater, so Monday afternoon manager Scott Smith got on a ladder in a frigid, cutting wind, removed the current letters, and put up the movie titles Jack asked for (“The Searchers” and “The General”). Around midnight, the “Monuments” team arrived on the square, turned on the marquee, and got their night shots, one of which involved temporarily replacing the pickup’s legal Illinois license plates with fake Colorado ones. Mark and I were fast asleep by the time Writer/Director Jack, Director of Photography Stephanie, and Production Designer Matt let themselves in the back door to occupy our guest bedrooms for one night. The next morning, north of town on Hwy. 92, Peggy’s grandson Zach Bruett helped Stephanie and Matt hoist their large, bulky, and incredibly expensive (rented) movie camera and tripod over the fence and onto his truck bed, and then coordinated the movement of the cows (coaxing them with tasty corn) between camera and fence, while on the highway Jack drove the movie truck through the shot for two or three takes. 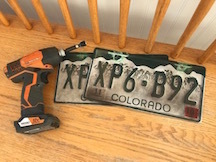 Later in the day, after lunch at Montross Pharmacy (involving Stephanie’s introduction to the Iowa Pork Tenderloin), as the crew headed out of town, Jack sent a text saying they had forgotten the fake license plates and Matt’s drill near the theater late Monday night. Would someone maybe have turned them in to City Hall or perhaps the police? Shortly, I made two of the weirdest phone calls of my life, with no results. That’s Winterset, Iowa, my home town. *Check out Jack’s fantastic documentary, “42 Grams,” about a Chicago restaurant that goes from a popup to the talk of the town, available on Netflix and ITunes. One of my community’s joys is welcoming visitors to our picturesque little town. 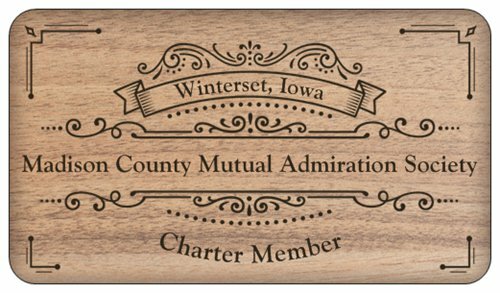 Collectively, we love to share the uniqueness that is Winterset and Madison County. Annually, in May, we embrace hundreds of guests for the John Wayne Birthplace Celebration, thousands in October for the Madison County Covered Bridge Festival. We open our arms every day in smaller ways as well, whether by giving directions to tourists looking for our covered bridges, pointing out our beautiful gift shops and other independently-owned retailers that line the square, or greeting quilters and quilt lovers who enter the Iowa Quilt Museum. Soon, my town will be opening its arms to a special, limited group of quilters. 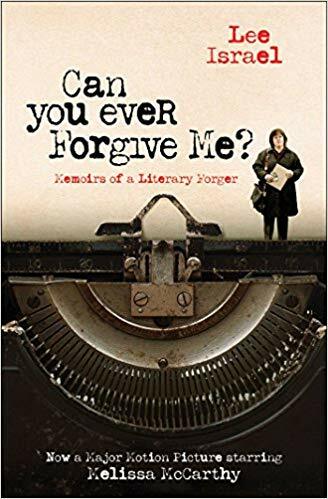 The September 13–15 event, titled “At Home with Marianne Fons,” has been organized by my longtime friend Marlene Ingraham, who waxes poetic about Winterset and the event here. Personally, I’ve been describing the weekend as a “quilting spa,” because once participants hit town and check into their accommodations, everything else is provided—fabric for my full-size quilt, “Darling,” (plus an additional project) sewing machine, special tools, instruction, snacks, lunches, dinners with local wines, and, of course, camaraderie. Mega quilters Paula Nadelstern and Victoria Findlay Wolfe will be in town for the kickoff. 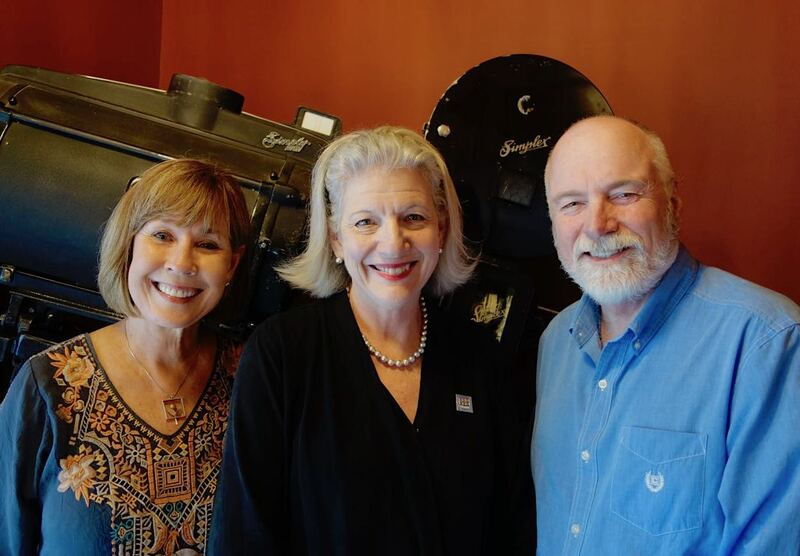 Iowa’s own Linzee Kull McCray, Tony Jacobson, and Diane Tomlinson have much to share as well. The whole thing will be like a soothing quilt massage. For years, in the popular “Tip Table” segment of “Fons & Porter’s Love of Quilting” on public television, I invited viewers to send their tips to a PO box in Winterset, Iowa. I encourage anyone who’s curious about the place I call home to come experience my stomping ground in a very quilty way. Nothing’s prettier than my town square on a national holiday. 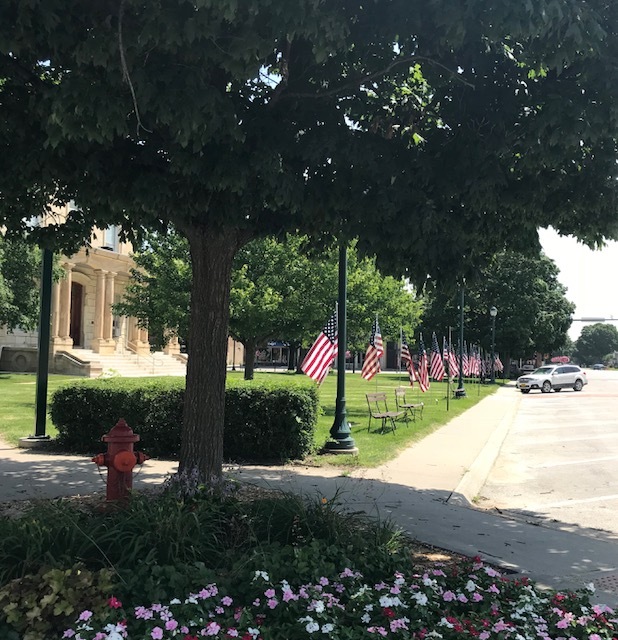 Sponsored by individuals and businesses, crisp, bright American flags line the perimeter of the courthouse on the lawn side and wave in front of storefronts on the retail side. The local Lion’s Club and Optimist Club, assisted by the Boy Scouts, place the flags early in the morning and remove them in the late afternoon. People sponsor flags on the residential streets as well, so on this Independence Day, our country’s beautiful flag waves gracefully all over town. I walk my dog Scrabble around the square each day, and this morning, while she and I were admiring the flags, we bumped into local friends I hadn’t seen for a while. The three of us stood under a shade tree to catch up, and in the course of our conversation I learned their daughter now has a dog, a mutual friend is moving, and other bits of social news. My friends happen to know I’m a moderate Democrat, and I happen to know they are moderate Republicans. Together, we bemoaned the extremism we observe—not in our community, but beyond—every day. We expressed nostalgia for moderation, when we really didn’t know what party anyone belonged to or what church they went to unless we went to that church, too. When parting, Craig said, “I’d like to start a new political party, the Equalitarian Party. Its core value would be equality for people of every stripe. Basic equal human rights would make up the planks of our platform.” I reached out and shook his hand before continuing my walk, and as Scrabble trotted along at my side, she wagged her tail, so I think she approved. Of course, Scrabble’s tail is pretty much always wagging, and she loves all humans, whether they have a party affiliation or not, so it was just a guess. Around age thirty-five, my years of traveling away from Winterset began. Liz Porter and I had published our first quilt book, CLASSIC QUILTED VESTS, in 1982, prompting a steady stream (via the US Post Office) of teaching and lecturing invitations from all over the US. After publication of QUILTERS COMPLETE GUIDE in 1992, and the launch of our public television how-to series in 1996, I was sought-after from all quarters, and in my thirties, forties, and fifties checked off several more states every year. I worked in Australia, England, and France. Always, I returned to Winterset, my father’s hometown and my own since age twenty-two, to the community where I learned to quilt and where I developed my own teaching skills and made lots of friends in the 1970s. (All the young women our age wanted to quilt!). Divorced at thirty-nine, I became the sole provider for my family. I moved into town from the little farm in Lincoln Township, and my social life in the community necessarily came to an end. My focus was squarely on making a living, improving the roof over our heads, and seeing that my daughters graduated from high school and college (all three did and now all have graduate degrees!). Except for Saturday morning coffee with my three best friends on weekends I was not away at a distant quilt guild or conference, I was at my desk or sewing machine, doing work I loved. After the sale of Fons & Porter in 2006, life changed for me in major ways. My kids were launched by then, and I had remarried. Instead of leaving town to work, I left instead with Mark to ride bikes in France or to visit my daughters in New York and Chicago. When home, I was still at my desk or sewing machine, corresponding with quilt-industry colleagues and making new quilts. In 2015, a local couple invited me to coffee at The Northside Cafe with the sole purpose of convincing me Winterset needed a quilt museum. Soon, I began inviting fellow citizens—some I had (barely) known for decades and others I met for the first time—to join a board of directors. The paint was barely dry on the Iowa Quilt Museum when I learned my town’s (shuttered) single-screen movie theater, The Iowa, might be for sale. Working with others to create and revive key features on Winterset’s courthouse square (now a National Historic District) put me in contact with the entire business community, one that had been growing and thriving while I was away. A big fan of cotton cloth, I became a new thread in the social fabric of a small town I had not looked at closely since my teaching days at the Ben Franklin Store (whose location had never budged). Armed a few weeks later with 500 membership cards, I began inducting one Madison County community member after another, putting each at ease by assuring him or her there would be no meetings, no dues, no board of directors, no fundraising, no website! I always hand each inductee several extra cards—so they can induct others. A few months after launch, Julie told me her daughter had come home from school enthusiastically waving a Madison County Mutual Admiration Society card. A friend had inducted her during in the course of the day.